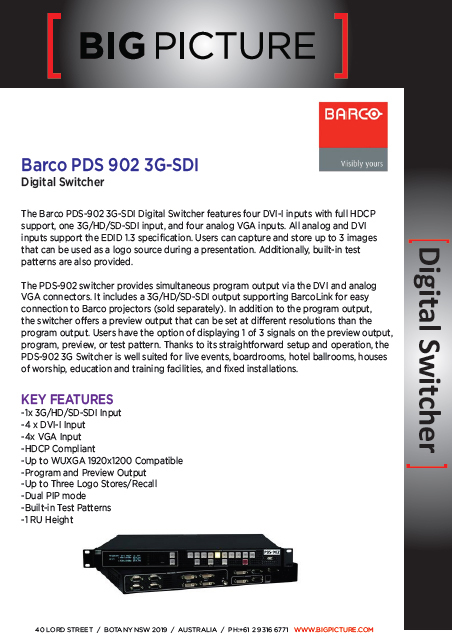 The PDS-902 switcher provides simultaneous program output via the DVI and analog VGA connectors. It includes a 3G/HD/SD-SDI output supporting BarcoLink for easy connection to Barco projectors (sold separately). In addition to the program output,the switcher offers a preview output that can be set at different resolutions than the program output. Users have the option of displaying 1 of 3 signals on the preview output,program, preview, or test pattern. Thanks to its straightforward setup and operation, the PDS-902 3G Switcher is well suited for live events, boardrooms, hotel ballrooms, houses of worship, education and training facilities, and fixed installations.